Warning: prices, links and product specifications for BenQ BL2405HT are submitted by our listed stores. Please notify us if you find any errors. 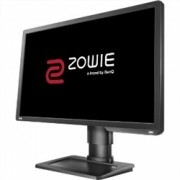 Search hundreds of online stores that deliver to Sydney, Brisbane, Melbourne, Canberra, Perth, and all over Australia and find the best offers for BenQ BL2405HT monitor (24 inch (61 cm) LED monitor, 1920x1080 pixels resolution, 250 cd/m2 brightness, 1000:1 contrast ratio). Only on ShopMania you can find the lowest BenQ BL2405HT prices available, learn about the latest discounts and compare monitors deals. Here you can browse through the BenQ BL2405HT photo gallery, find out all about its features and specs and read the product reviews and user comments from our community. The monitor with a 24 inch (61 cm) diagonal is big enough for working with complex software applications or very large images. With a 1000:1 contrast ratio, this monitor ensures a clear screen illumination, but it is unsuited for viewing under either weak or strong light. With a response time of 5ms, the images displayed by this monitor are impeccable.